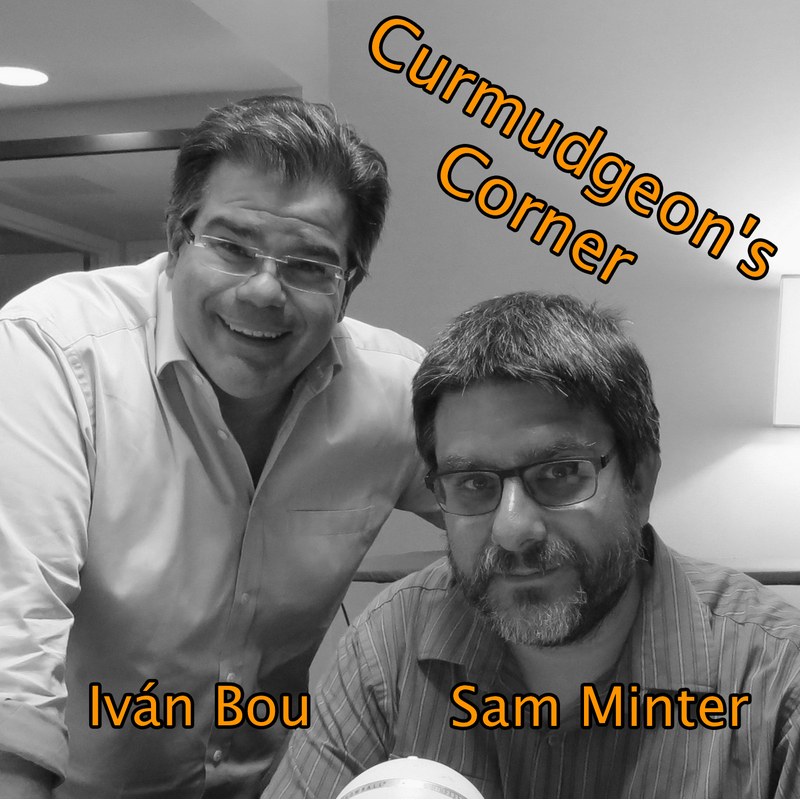 This week on the Curmudgeon’s Corner podcast Sam and Ivan talk about television, thermostats, manipulating public opinion and a few other things besides Election 2016, but of course most of the show ends up being about the election. They cover the last gasp Sanders path to the nomination, Trump zig-zagging on the issues, the Republican civil war, and possible Trump VPs. Oh, and Sam’s son Alex keeps interrupting to promote his YouTube channel. 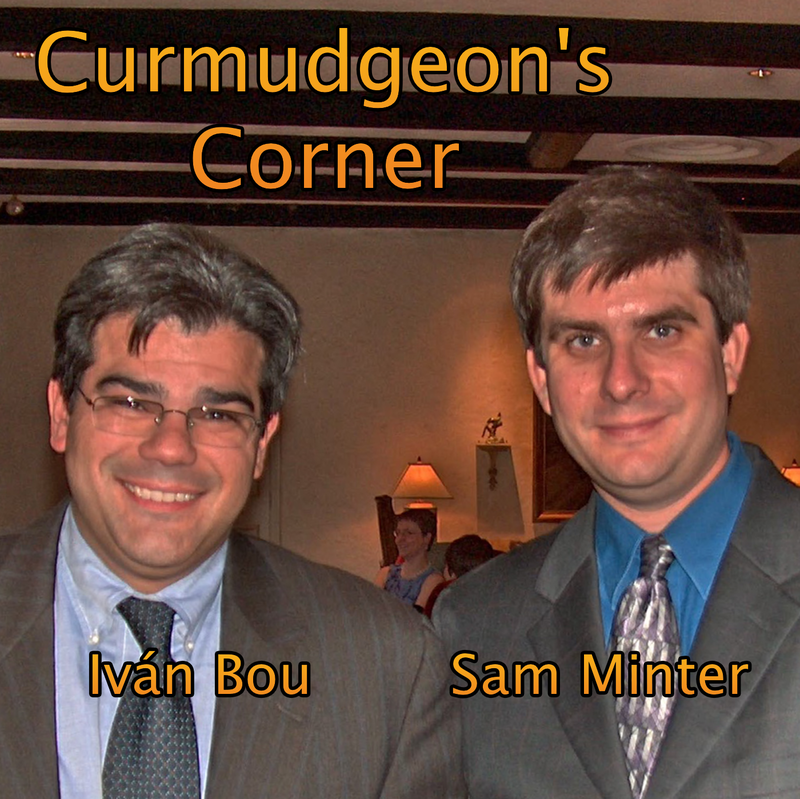 On this week’s Curmudgeon’s Corner we apologize for last week’s show, then jump right in on Election 2016 analysis. We cover Biden’s exit and the results of last week’s debate, and what all that means for Clinton. Then we move on to the Republicans, talking about Trump’s staying power, how the only one close to him is Carson of all people, and how Bush is crashing and burning. With the Presidential race out of the way, we spend some time on Paul Ryan and the race for Speaker. Then finally in our lightning round we hit Back to the Future Day, iPads and iPhones, the hospital bombing in Afghanistan, book and movie reviews, and more! 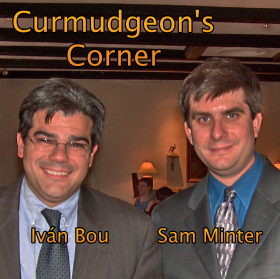 This week on the Curmudgeon’s Corner podcast, Sam and Ivan talk about Russia’s involvement in Syria, the chaos around the race for Speaker of the House, and of course the weekly rundown of the 2016 Presidential race. In the lightning round we spend way more than the allotted 2 minutes on self driving cars, but also touch on Jade Helm, drug prices, singing Happy Birthday, and more! Oh yeah, we also mention the coming apocalypse that will destroy us all! Good or bad for Russia? 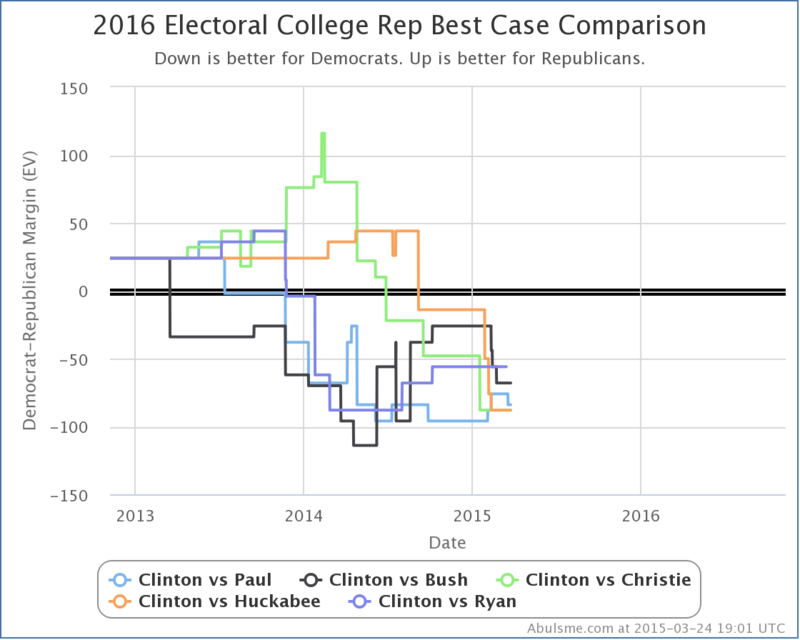 Election Graphs Analysis: Rubio beats Clinton! I added a bunch of new polls today, catching up after being preoccupied with something else the last few days. The first thing to note is a change to the “top five best polled” candidate pairs. With the latest batch of polling, a well polled state (North Carolina) that had been really close in Clinton vs Walker became less close, and thus this combination slipped out of the top five, replaced by Clinton vs Ryan again. I expect this won’t last long, with one of Clinton vs Rubio, Clinton vs Cruz, or Clinton vs Walker once again jumping onto the top five very soon. 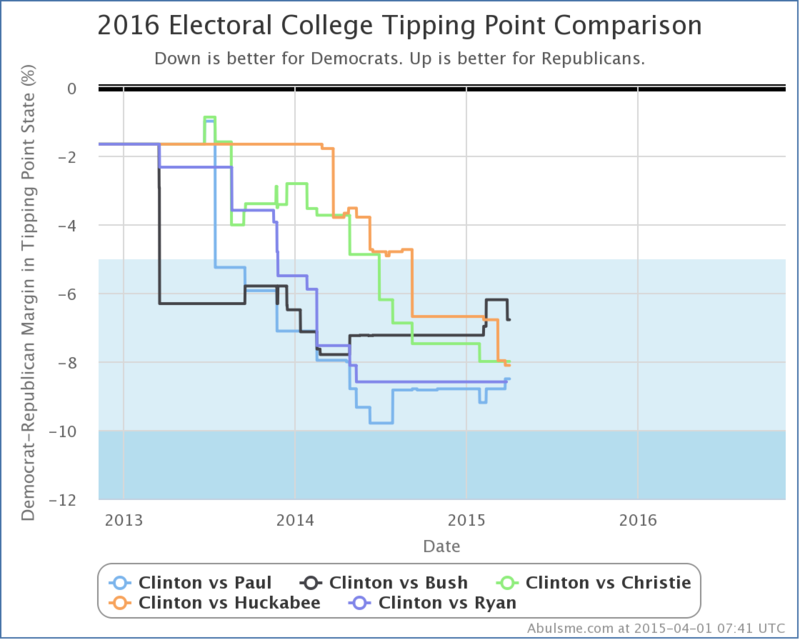 With this the tipping point moves from Clinton leading in Virginia by 8.4% to Clinton leading by 7.6% in Ohio. This is a nice bump toward Paul. 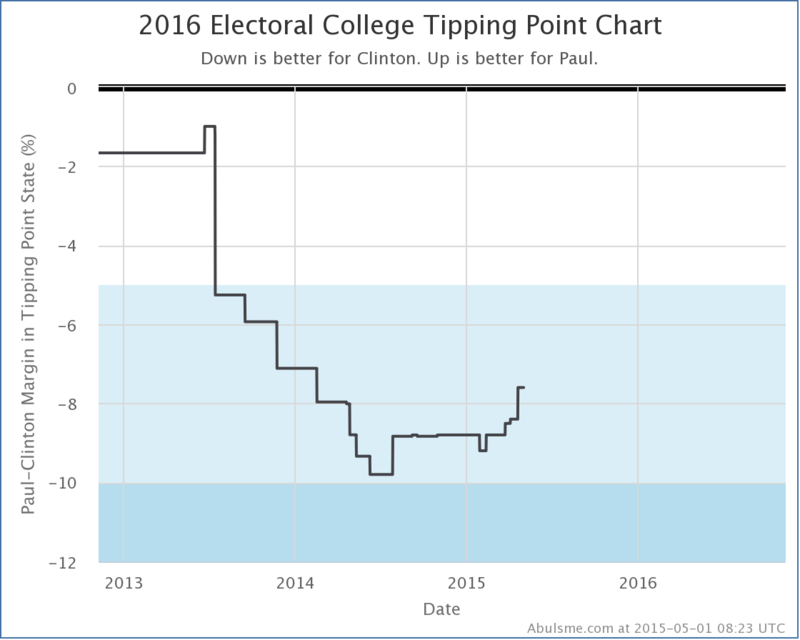 We’re still in “Strong Clinton” territory by this metric of course, but this continues a general trend of Paul’s tipping point against Clinton improving ever since last summer. 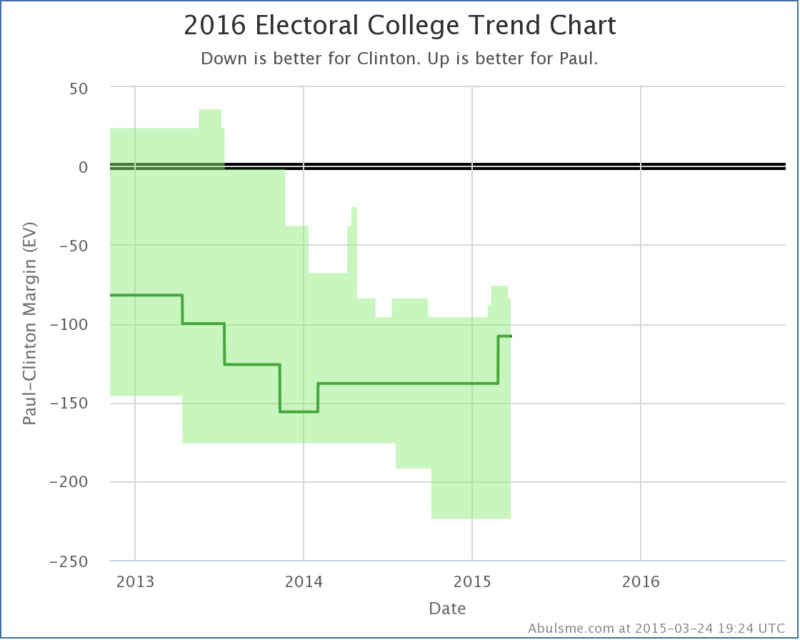 Paul and Bush are the only two Republicans in the current five best polled combinations that can claim a positive trend against Clinton on this metric. 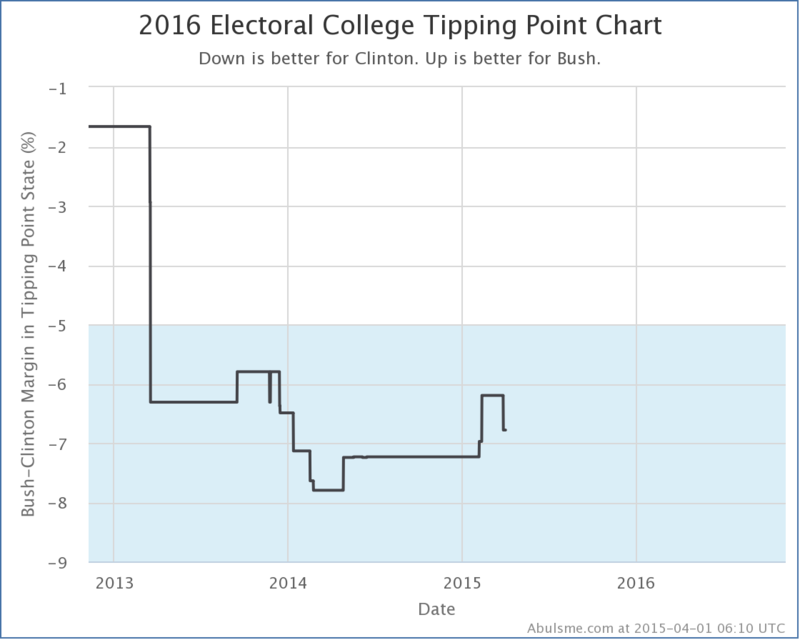 This brings Bush’s best case to losing to Clinton by only 24 electoral votes. 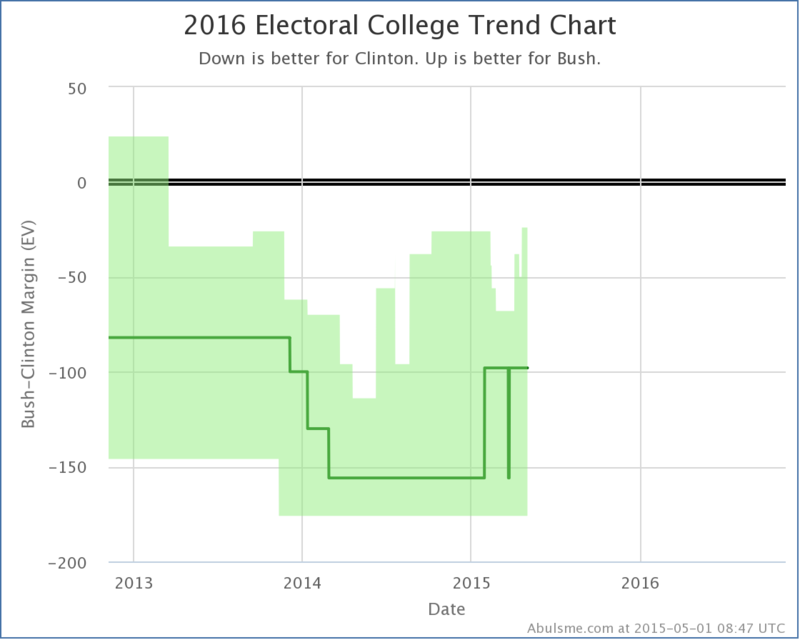 This is the best best case Bush has had since there was any real significant polling on 2016. Bush is currently doing better against than the other four Republicans in the five best polled combos in every metric I’m tracking. If he can make at least another 12 electoral votes close… say perhaps Iowa (6 EV) and Minnesota (10 EV)… the two “Strong Clinton” states that are the weakest for Clinton at the moment… then for the first time since early 2013 (when polling data was still sparse and we were mainly relying on previous elections) we’ll have a real race, where the Republican is actually in contention. Normally I wouldn’t mention combinations not in the top five, but since Clinton vs Walker just fell off with this update, I’ll briefly note that the news was mixed for him in today’s batch of polls. 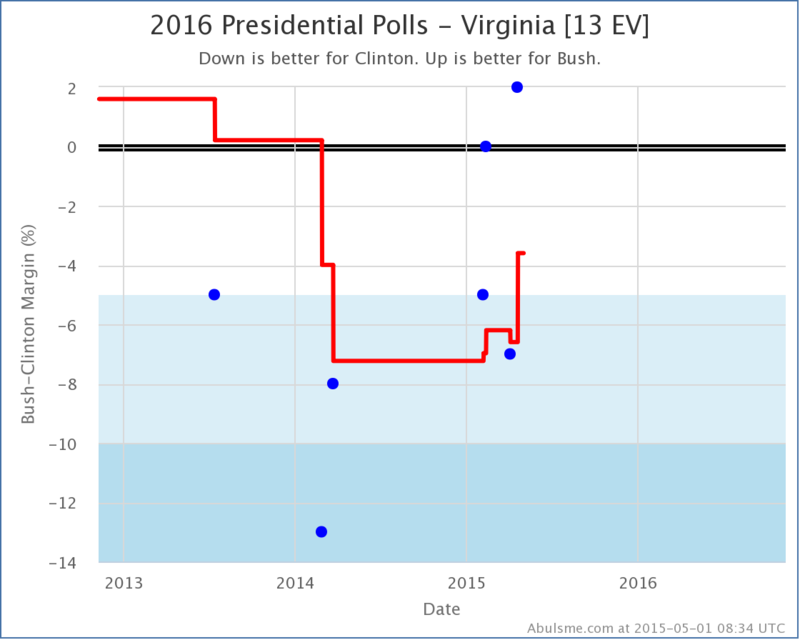 On the one hand, he improved in Virginia, which improved his tipping point. On the other hand, North Carolina flipped from Weak Walker to Weak Clinton, increasing the amount he would be expected to lose to Clinton by if each of them won all the states they were ahead in. 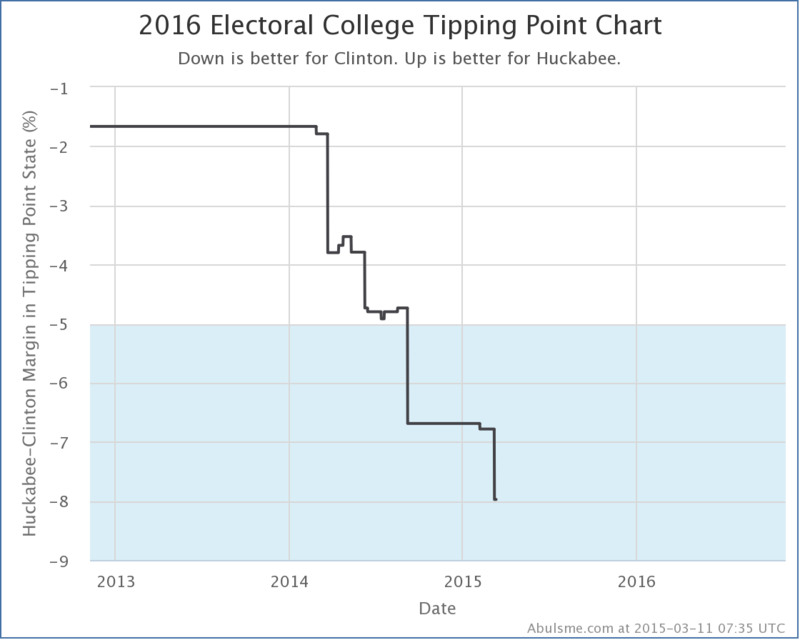 Note: This post is an update based on the data on my 2016 Electoral College Analysis Site. All of the charts and graphs seen here are from that site. Graphs, charts and raw data can be found there for the race nationally and in each state for every candidate combination that has been polled at the state level. In addition, comparisons of the best polled candidate combinations both nationally and each in each state are available. All charts above are clickable to go to the current version of the detail page the chart is from, which may contain more up to date information than the snapshots on this page, which were current as of the time of this post. In my update today I added polling data from Quinnipiac (7 candidate combinations in Florida, Ohio and Pennsylvania), Gravis (5 candidate combinations in Nevada), and Saint Leo (5 candidate combinations in Florida). 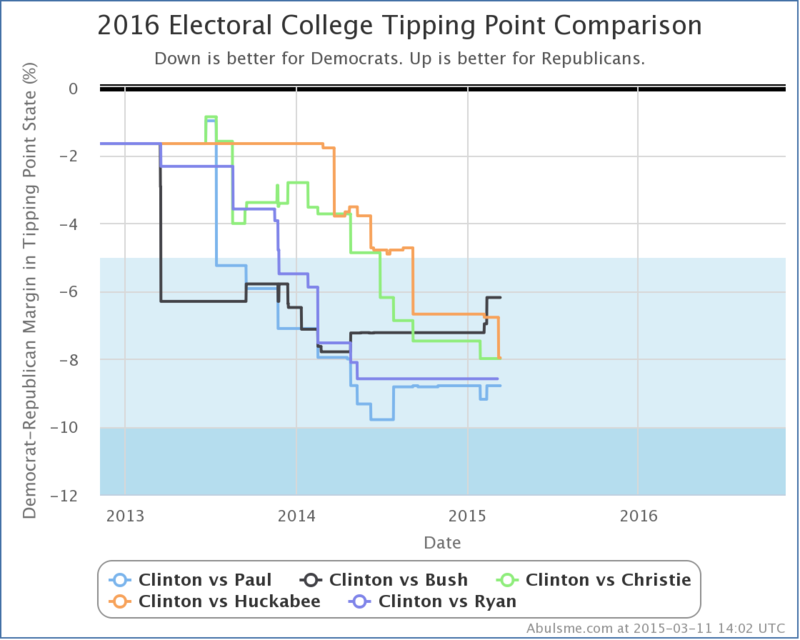 This resulted in a variety of status changes, but only a handful that meet my threshold for talking about here, which is that either the electoral college summary or the tipping point needs to change for one of the five best polled candidate pairs. In both of these, you can see the slight dip at the top right of the “envelope of possibility” representing Nevada no longer being included in the “best case” for the Republican. First off Clinton vs Bush. With today’s added polling and Nevada getting bluer, the tipping point moves from Clinton by 6.2% in Virginia, to Clinton by 6.8% in Minnesota. Then Clinton vs Huckabee. Ohio moves further toward Clinton, and the topping point shifts from Clinton by 8.0% in Virginia, to Clinton by 8.1% in Ohio. Finally, the one move in the directions of the Republicans today. Ohio moved in Paul’s direction with todays update… the poll average went from a 9.2% Clinton lead to a 7.6% Clinton lead, which was enough to move the tipping point from Clinton by 8.8% in Virginia to Clinton by 8.5% in Wisconsin. So, there has been some press lately on how Clinton’s email issues have hurt her at the polls. There has also been press saying it hasn’t had any significant effect. National polls would of course register short term changes much much more quickly that the state polling I look at here, where even the best polled states only get polled a little more than once a month. It really is too soon for effects of that particular thing to show strongly in the kind of analysis I do here. Until we get to the last few months before the election, you’ll be able to see long term trends here, but not short term reactions to individual events in the news cycle. For the moment, there aren’t any strong trends here to call out. There has been movement, but not a whole lot, and it depends on which Republican you look at. One comparison that I haven’t done in awhile here is looking at these numbers vs 2012. The final result in 2012 was Obama 332 to Romney 206, or Obama by 126. 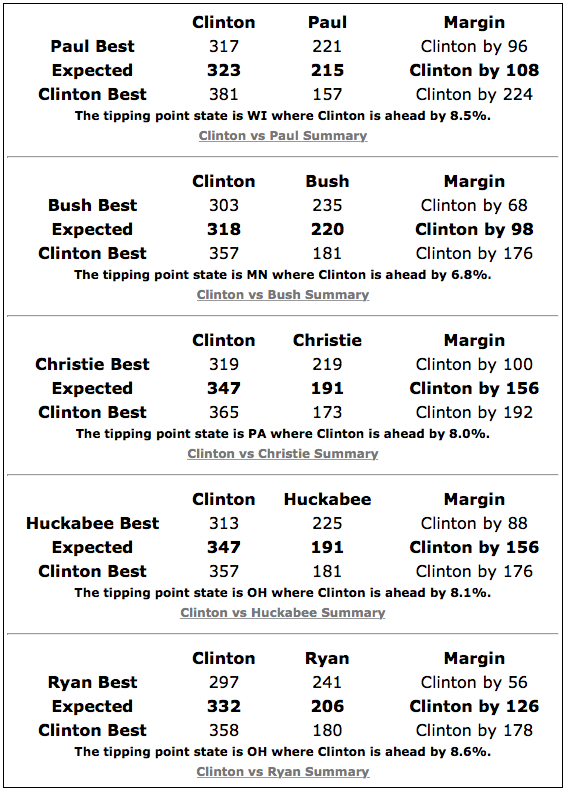 So while all five Republicans here are currently well behind Clinton in the expected electoral college outcome, both Bush and Paul are doing better against Clinton than Romney did against Obama!! So while Clinton still has a healthy lead here, we’re nowhere near landslide territory or anything like that. Remember that a 10% tipping point margin (a relatively huge lead) still means the results of the election can be flipped if just 5% of the people change their minds (or don’t turn up to vote, or whatever). As I mentioned in my last update there is a lot of interest in a few other candidates too. Right now Clinton vs Cruz is the 6th best polled combo, Clinton vs Rubio is at #7, and Clinton vs Walker is at #8. You can click through on those links if you want to see what those look like at the moment. But the amount of state level polling on those guys still isn’t that great (although they are catching up), so take what you see there with a big lump of salt. A bunch of new polls were added to my site today, but there was only one notable change. 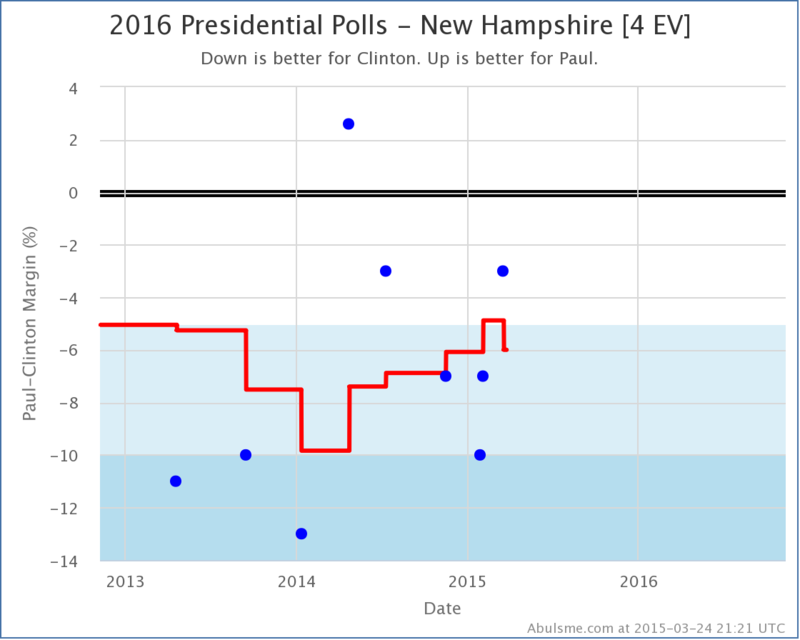 With a new Gravis Poll, Clinton’s lead in New Hampshire against Paul once again goes over 5%. Easy come, easy go I guess. This decline happens as the only poll so far showing Paul in the lead here falls off the average. That poll is looking more like an outlier at this point. Even without that one poll though, if you squint there does seem to be a general trend in Paul’s direction over the last year or so. As usual, we’ll have to wait for more polls to see if Paul resumes closing the gap in the average, or if this is actually a reversal of the trend. What about Cruz you say? Didn’t he just announce? And Walker? He’s still getting lots of buzz! Or maybe even Rubio? Well, the polling on those combinations still isn’t that great and don’t make my top five. But they are improving. Right now Clinton vs Cruz is the 6th best polled combo, Clinton vs Rubio is at #7, and Clinton vs Walker is at #8. You can click through on those links if you want to see what those look like at the moment. But the amount of state level polling on those guys still isn’t that great, so take what you see there with a big lump of salt. 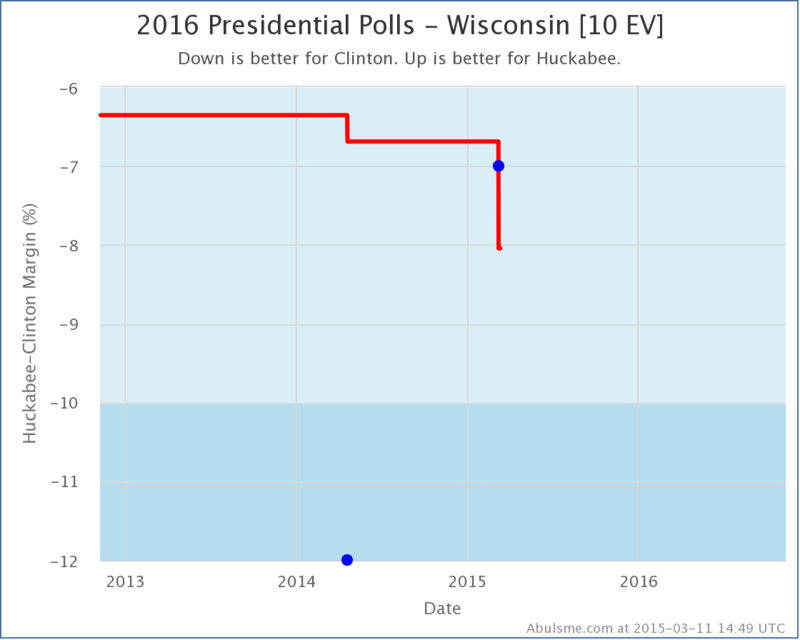 Today’s update was new PPP polling in Wisconsin. PPP polled 11 candidate combinations. Of these only one produced a notable change in one of the “5 best polled candidate pairs” I track most closely here. So with no category change, why am I bothering with a post? Well, Wisconsin slipping further into Clinton territory (from a 6.7% Clinton lead to a 8.0% Clinton lead) reshuffled the ordering of the states when sorted by margin and Wisconsin slipped past Minnesota (where Clinton leads by 6.8%). Minnesota had been the tipping point state. So Clinton doesn’t necessarily need Minnesota any more, because it is easier to get Wisconsin. 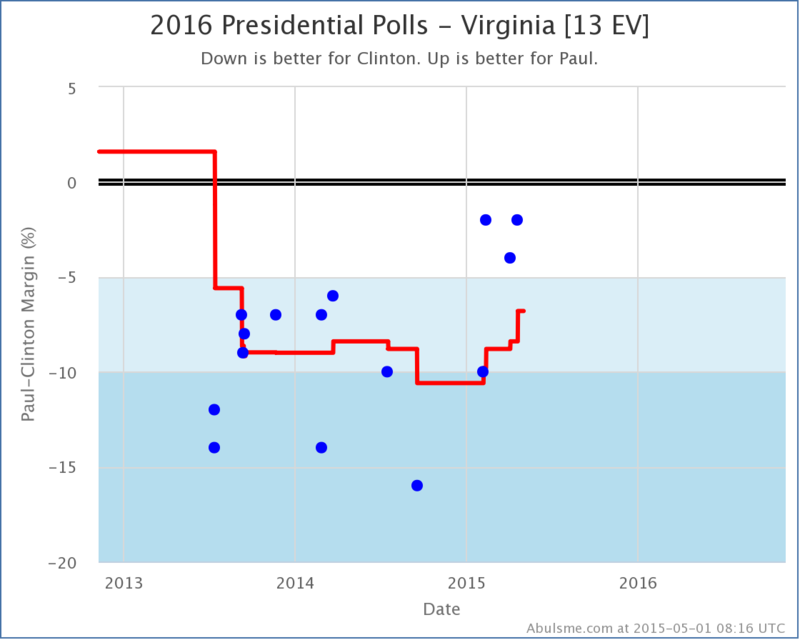 This means the tipping point shifts to 8.0% in Virginia. The last time the tipping point moved even briefly in Huckabee’s direction was last August, but as you can see, the general trend has been that the more polling there is on this combination, the worse it looks for Huckabee. 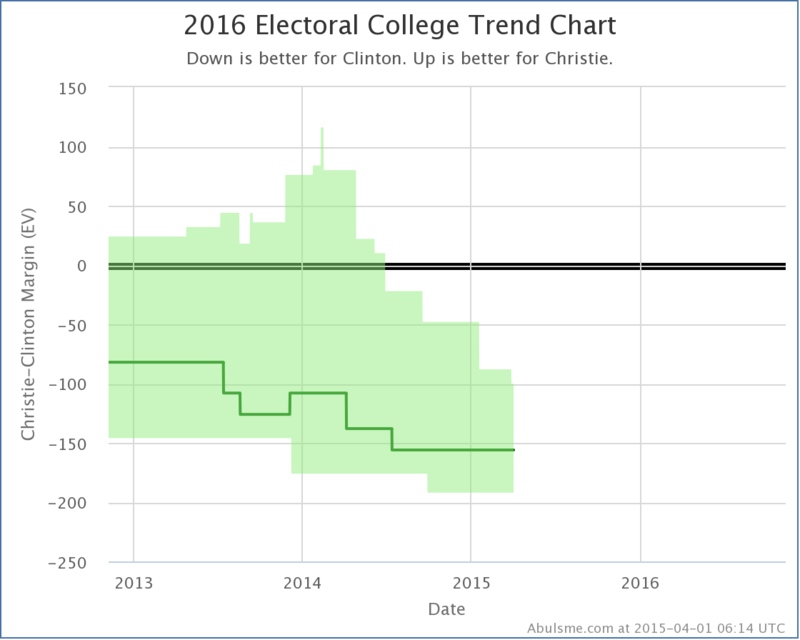 All of the Republicans are running way behind Clinton, but the trends are different. Ryan has said he is not running of course. There is also lots of talk about Walker, and sometimes of Cruz or Rubio, or even of combinations involving Democrats other than Clinton occasionally, but polling at the state level on all of those other combinations is still significantly more sparse than the five combinations here, and therefore the data less reliable, so we leave them out for now. Edit 2015-03-16 17:44 UTC to add standard note to end.